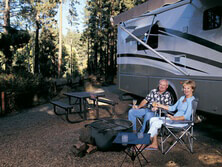 Purchasing an RV is a major investment. Next to a house, an RV may be the next largest purchase people make in their lives. In order to protect your investment, an extended warranty is always a good idea to pick up where your manufacturer’s warranty leaves off. Here at Campbell RV, we have many extended warranty options available depending on your needs. Our experienced service department mechanics and technicians are trained, trustworthy, and dedicated to getting you back out on the road to your next vacation destination. Just purchased a motorhome? Check out our Eagle Extended Service Protection – Motorized Coverage. You never know when an unexpected problem could arise when you’re out on the open road. Our RVs are protected with the Ultimate Guardian plan. This plan provides coverage for almost all factory-installed mechanical, hydraulic, and electrical parts of your vehicle. Benefits include meals, lodging, towing, and other allowances for unexpected events. Choose from platinum, gold or coach/living extended warranty plans. Each level covers a number of listed components depending on your needs. Take the worry out of owning a motorhome and gift yourself with some peace of mind. Your travel trailer can also be protected with warranty coverage from the Eagle Extended Service Protection Corporation. Every customer, including towable owners, should have a safeguard against costly repairs. The Ultimate Guardian plan covers a long list of components as well as emergency tire blowouts, service calls, and 50% of part replacements. Our service department handles 100’s of motorized and towable RVs and are top notch in customer service. We know how to get the job done. For more information on how to protect your RV investment with an extended warranty, Call us at (941) 342-4330, Contact Us at Campbell RV or visit us at Our Location.